The Hunt Is On! Children love the competition of a scavenger hunt with a Maths twist, and it’s also a great way to encourage outside-the-box thinking. This is a truly versatile format that can slot into your lesson whatever age and topic you’re planning for. And don’t despair if the weather takes a turn for the worse. The hunts can easily be adapted to an indoor setting. A scavenger hunt is a game that is usually played in pairs or a small team, that takes place in a large area – for instance, your school grounds. The teacher will give each of the teams a pre-prepared list of objects that need to be found in that area. 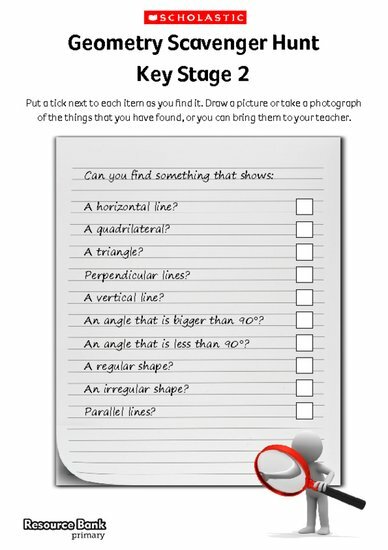 With a twist on the usual game, many of these maths hunts will ask children to find and then photograph, or draw, what they have found for each of the items on the list. The scavenger hunt at this stage focuses on geometry. There are many new words that children have to understand the meaning of when discussing shape, such as perpendicular, parallel, regular and irregular. This hunt can be used in two ways. Firstly, children could carry out this activity to introduce them to the new vocabulary. Provide children with a maths dictionary as well as the scavenger hunt list so that they can look up any words they are unfamiliar with. They can then search out objects in the school grounds that demonstrate the chosen words. When carried out in this way, the children could also use their scavenger hunt list and photographs to create their own geometry glossary to be used at a later date. The hunt can also be used as an assessment task at the end of a unit on geometry, so that children can demonstrate their understanding of key terms. This is a fun way to carry out a summative assessment.